The cryptocurrency market originated in 2009, with a small project called Bitcoin, which kick-started an entirely new financial concept. Since then, many new players have followed Bitcoin's lead and created their own digital currency. A few of the more well-known 'followers' are Litecoin, Ripple and Ether. The growing number of cryptocurrencies might actually become a little bit confusing for traders, which is why today's article will compare Bitcoin/US Dollar with Ethereum/US Dollar CFDs and ask the golden question: which one is better for trading purposes? Before we start, have you tried the MetaTrader 4 or MetaTrader 5 Supreme Edition? 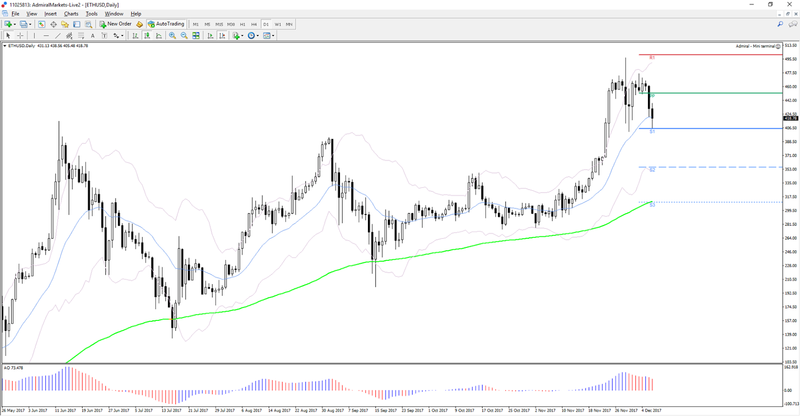 Our unique plugin for MetaTrader trading platforms offers over 60 exclusive tools and indicators to help you take your Bitcoin and Ether CFD trading to the next level! Check it out and download for free today. For now, back to our golden question... Below we'll review five factors that might point us in the right direction before we reach a final conclusion – BTC/USD vs. ETH/USD: which is better to Trade? Bitcoin's 2017 low and starting point was around $740. Bitcoin's 2017 high was above $19,000. You might be surprised to learn, however, that Ether has had a similar journey with its price movement versus the USD. ETH/USD started at around $7.65 on the 1 January 2017 and has since risen to a whopping high of nearly $1,200. 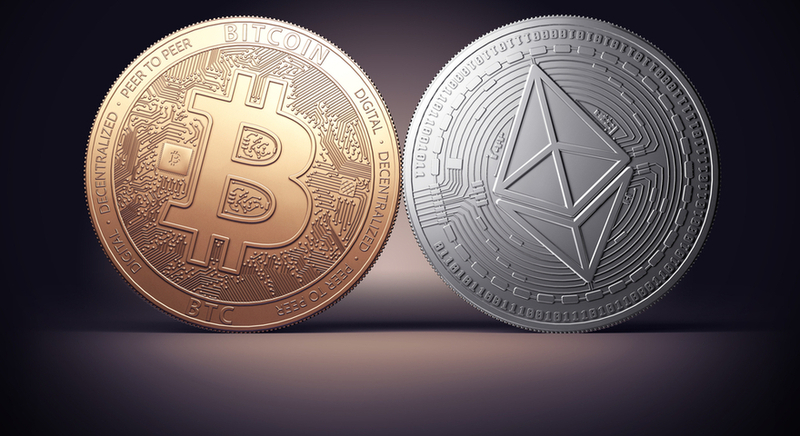 In absolute terms: the BTC/USD CFD's bullish move was larger in 2017, as price grew by more than $14,000, whereas the ETH/USD CFD increased around $490. As a percentage: from a relative point of view the crypto pair ETH/USD takes the win, as it grew by a factor of more than 150 (compared to BTC/USD, with a factor of more than 25). Who will be the winner in 2018? That's very difficult to tell, but Bitcoin's leadership role (see factor 2) could make a continuation of Bitcoin's bull run, with levels of $25,000, $50,000 or even $100,000 no longer a fantasy. The highest ever Bitcoin price is probably not yet written in stone. 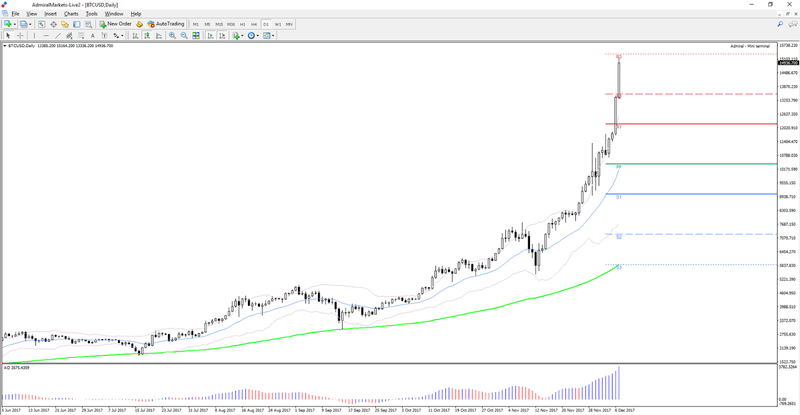 From this perspective, the Bitcoin chart seems to have the upper hand, as it's considered to be the market favourite – especially when considering its constant bullish price action and strong uptrend. You can clearly see the difference when you compare it to Ether, which had its bull sprints here and there but not as consistently as Bitcoin. All in all, both instruments have moved up a lot so be aware that there is always a risk of market prices falling on unexpected news. Also the risk of an implosion can never be ruled out either, when considering how new these asset classes are. Below you can see the Bitcoin chart plotted against the US Dollar (BTC/USD) for the second half of 2017. Bitcoin remains the most well-known cryptocurrency and there seems to be no threat of it losing that position. Therefore, the chance that Bitcoin will be able to preserve this status in 2018 as well is fairly decent. The benefit of the leadership role for Bitcoin is that it could attract more investors. Cryptocurrencies in general, but specifically Bitcoin, are perhaps becoming more alluring for bigger investors, perhaps institutional investors as well. Bitcoin is well positioned to receive much of their attention, if 2017 is anything to go by, Ether may receive a smaller part of the investments – but that remains to be seen. Each cryptocurrency has a different method and set of rules that go along with its creation, distribution, and protection/security. It is useful to know the specifics of each cryptocurrency, whether it's Bitcoin or Ether, and feel comfortable with their parameters. How does Bitcoin work? Bitcoin's emphasis as a peer-to-peer decentralised payment system has been more on security and the process of mining (which is how Bitcoins are created). You can find out more about this in our What is Bitcoin? article. How does Ether work? Ether offers more than just a payment system. According to the Ethereum Project itself, Ethereum is a "decentralised platform that runs smart contracts: applications that run exactly as programmed without any possibility of downtime, censorship, fraud or third party interference". 1 If you'd like to know more about Ether, check out our 'What is Ethereum?' article. Bitcoin's supply is capped and fixed at 21 million, whereas Ether has a supply growth that is capped each year. Bitcoin, created in 2009, has a block time of 10 minutes, whereas Ether is currently about 14 seconds 2. Trading an instrument you like is not a must, but having faith in its long-term potential and design could make it easier for traders to hold on to swing trades and aim for larger targets. This particular factor is very personal and will depend from trader to trader. Keeping up-to-date with some of the developments within each cryptocurrency will also provide some key information about possible price reactions. The Bitcoin Cash hard fork – away from the original Bitcoin – for instance, did temporarily impact price – so keeping an eye on trends like this can be important. From this perspective, Ether is slightly more stable than Bitcoin, when taking into account the most recent split. In any case, it doesn't hurt to keep an eye on the latest trends in each cryptocurrency and to see whether one of the two offers less risk and more stability. This can also change from month to month, as trends and news updates in this space continue to come thick and fast. Trading is not only about the fundamentals (factor 2 and 3) or long-term potential (factor 1), but also simply about the price action and volatility of a cryptocurrency. This is especially important when trading on lower time frames, for example. Why? Slow moving instruments do not offer interesting trade setups because it is difficult to obtain a profit by entering and exiting if price hardly moves up or down. Volatility is key as it provides opportunities for traders. Price action is also key: it is important to review Ether and Bitcoin charts and familiarise yourself with the instrument. This is even more valid for short-term charts, where price action can sometimes be quick and unexpected. Some instruments will also fit your style of trading more naturally. You should always make sure you know how to trade Bitcoin CFDs before trading it with real money. We recommend signing up for a free Demo account and practising in a real trading environment, with virtual funds. Which one is better to trade? All in all, both! Bitcoin and Ether offer sufficient volatility and price movement for trading purposes. Traders should keep an eye out for both cryptocurrency pairs and see which one is better suited for trading on that specific day, week or month. Choosing your favourite instrument really depends on your own preferences. Test both of them for a while and see which one suits your own market vision. Cryptocurrencies may be everywhere at the moment, but the very good news is that they're not the only products on offer. Admiral Markets is your perfect partner for trading Forex and CFDs on shares, stock indices, commodities and bonds!